eEye Digital Security’s Blink Professional is a small profile program that really delivers. Blink Professional replaces multiple security agents, helping to protecting against known exploits and zero day attacks. eEye Digital Security’s Blink Professional is a well rounded security tool that is inexpensive and well worth the money. With Firewall, Spyware, Malware, Intrusion Prevention, Vulnerability Assessment and System Protection this tool becomes an invaluable protection asset in your network. Blink Professional is simple to install, has a small profile of less than 80mb. If services or processes are in use, the program will request an expected reboot of Windows to activate it’s full protection. The program is compatible with all modern versions of Windows and installed on Vista without any errors. Licensing and customer login is a snap. eEye Digital Security’s user interface is well planned and easy to use. Outlined with drop downs, each independent feature gives a clear indication of the current status of the five areas of protection. Clear green check marks indicate an active status on protected components, giving the end user a visual aid in seeing the immediate areas of protection. With an interface using ‘back’ and ‘forward’ buttons, navigation is a easy. Many full featured products have interfaces that are hard to navigate and get the end user lost. With eEye Digital Security Blink Professional, the enduser can find any setting by clicking no more than three times! The firewall component when enabled, allows for the customization of traffic flowing in and out of your workstation. With options that control system wide rules, the firewall can be used to supplement any external hardware firewalls. Logging and alerting is available for analysis and making the end user aware of what traffic is trying to get in. With application specific rules, users can control how applications access your network or the internet. With the advanced options, common ports and applications can be given access assisting the user with decisions about protecting their network. With application traffic, Ask / Allow / Deny options allow the user to decide how individual traffic is handled. 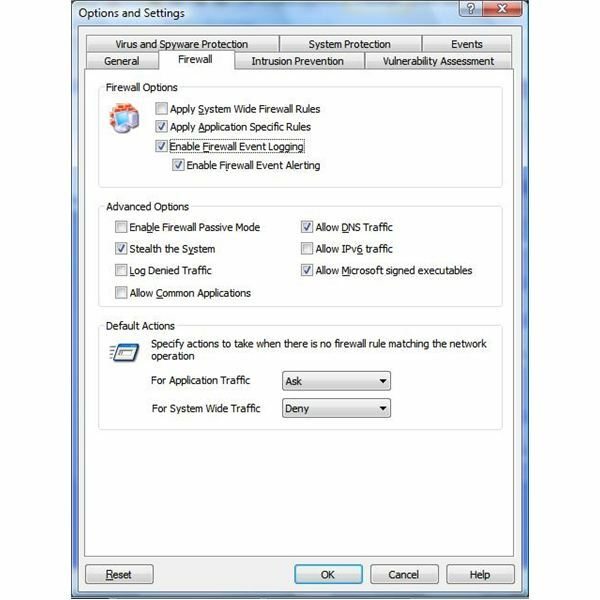 This great feature is an exceptional add- on to your internal windows firewall and your hardware firewall. Helping to further protect users, the intrusion prevention component adds a smart technology that monitors network activities for malicious behavior. This software reacts in real-time to prevent these malicious activities. An added option is an advanced technology that helps to prevent ID Theft.. 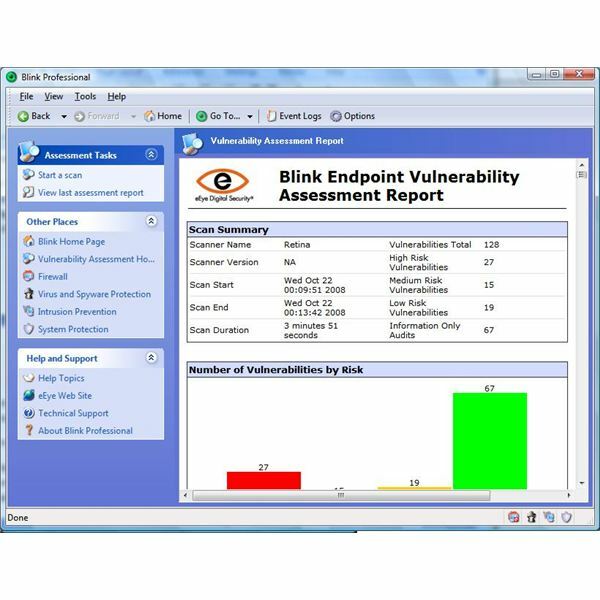 The Virus and Spyware protection added to eEye Digital Security’s Blink Professional is a nice supplement to your current antivirus and anti-malware program. With action settings that allow the program first option and choice on how to handle these items, it frees the end user from making sudden decisions on how to handle these rogue pieces of software. Additional settings allows for the customization of files ignore during a scan and quarantine folder size. This feature is also an excellent component that provides additional protection against viruses and spyware. The vulnerability assessment scanner scans for vulnerabilities, misconfigurations and any settings that may produce a security issue with your system. With eEye Digital Security’s Blink Professional, this scanning utility also gives registry tweaks that create a rock solid hardened system. These tweaks are often over looked or commonly ignored by other security vendors. After scanning, the user can see each of these security deficiencies in a full comprehensive report. The number of findings is also listed on the main Blink screen, reminding the user to harden their system. This report is easy to understand with step by step instructions on how to correct these problems. eEye Digital Security gives the user options to set schedules to scan for vulnerabilities and get automatic updates. Having these components automatically update ensures your system will be fully protected. The software package is full of excellent additional features found under each component. More high quality features include the automated support provided by the program and the extensive knowledge base. A small powerful security program, eEye Digital Security Blink Professional is a needed asset in your network. This independent endpoint protection is the defacto for workstation security suites. At less than $30 per host for 10 or more PCs and with a full range of protection components that are fully customizable, eEye Digital Security is right on the money. Would you like to read more reviews? Look around Bright Hub and you’ll find reviews of numerous other leading security solutions including Norton Internet Security, Kaspersky Internet Security, ESET Smart Security, McAfee Total Protection and ZoneAlarm Internet Security Suite.